Platinum Rated Luxury Home-Close to lift! 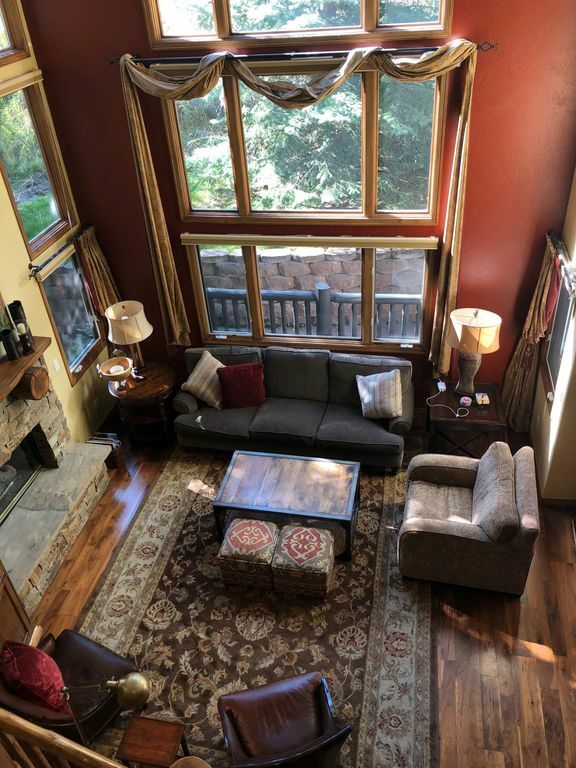 This non-smoking Platinum rated four bedroom Arrowhead end unit townhouse is located within one of Vail Valley's most exclusive gated communities at the base of the Arrowbahn high speed lift. · Perfect floor plan for families, 2+ couples or multiple families!
. Kids 'Paradise Bunkroom' with an adjacent rec room with new TV, soundboard, and tech equipment installed spring of 2017.
. Ideal floor plan for multiple families features: (2) King Master Suites (1) Queen Bedroom (1) Large 'Kids Paradise' Bunk room that sleeps 4. From your front door, begin your world class skiing experience by walking less than 300 steps to the Arrowbahn lift, the western access point to the European style village to village skiing terrain that only Beaver Creek, Arrowhead and Bachelor Gulch, can offer. Enjoy world class skiing for all ability levels, award winning ski school, and a free resort shuttle service. In the summer, bring your hiking, biking and swimming gear and enjoy the beautiful mountain and Arrowhead pool or bike ride using the bike path to the some great parks and shopping just a few miles to the west. Also be sure to catch all of the cultural and musical events that are offered in the Arrowhead, Beaver Creek and Vail neighborhoods. Nestled in the Arrowhead Ski resort mountainside, guests can behold close range views of elk and fox as they enjoy their morning coffee. Featuring a spacious great room with soaring twenty foot ceilings and plenty of natural light, a fully equipped kitchen and breakfast counter that opens up to a stunning dining room which comfortably seats 8, this home design makes eating in or entertaining guests both inviting options. Upon request and availability, host will provide grocery shopping and catering for an additional fee for parties up to 10. With two Master bedrooms on the upper level and two bedrooms and an additional family room 2 floors below, this home is ideal for a 1 family or 2 family shared vacation experience. Conveniently located in Edwards, 12.5 miles west of Vail, the Arrowhead neighborhood is part of the prestigious Beaver Creek/Arrowhead Ski resort. This home resides within a gated community appealing to those with a desire for luxury, privacy and relaxation as well as an appreciation for the natural beauty and recreational activities that only the Colorado outdoors can offer! Guests of this property can walk to resort amenities: a shared hot tub that is less than 25 yards away, a restaurant and bar and a free door to ski lift resort shuttle service as well as year round village pool and hot tub privileges! (See amenities for more detail). This Arrowhead town home is an exceptional value based on it's exquisite mountain decor and close proximity to the lift (it's a shorter distance from the front door to the lift than the distance from the Arrowhead parking lot to the lift! ), high-end finishes and interior decorating by one of the areas finest builders and designers. Your hosts have been sharing their mountain home since 2008 and know just what their guests want- luxury, comfort and cleanliness conveniently nestled close to the ski lift! Your hosts have lived in the Vail Valley for over 20 years and can assist you with vacation planning upon request. E-mail us now to inquire or secure your summer, fall or winter vacation plans! A $500 deposit plus 1/2 of rental rate is due upon booking. The balance is due 30 days prior to reservation date. 7 hours of cleaning are included for a 3 day minimum stay. Cleaning beyond that is contracted out at $25.00/hour. Damage fee is charged by incident. Late departures will be charged for an extra night. Check in is at 4:00 p.m. and check out time is 10:00 a.m.
A $25 per adult per night surcharge for adult parties greater than 4. I.e. no surcharge for the first 4 adults but the 5th, 6th, 7th, etc... will be charged a $25 surcharge per night. 3 NIGHT MINIMUM DURING SKI SEASON. NO PETS OF ANY KIND ALLOWED. NO SMOKING. The mountain wraps around the house and makes you feel all nestled in. Very rustic and cozy. The only thermostat is on the middle floor. It regulates the whole house. On the main and lower level, there are gas fireplaces. The lower level is operated by a remote control, the mid level is controlled by a switch on the wall that blends in with the stone work. The net work name and pass word are in the Guest Book which you can find on the Kitchen counter upon your arrival. The kitchen is stocked when we leave and is usually stocked when we return. That means that people replenish things like coffee, baggies, napkins etc... as they run out. That makes it nice for all. one in every bedroom and one in the main level family room and one in the lower level family room. Gas Fire pit with table and seating. We have a boot warmer in the garage. Maintained with upscale furnishings and nothing overlooked! Will definitely be returning!!! We had a wonderful week ! Barbara Jean and Mike nade everything so easy ! Such a lovely home ! Great location, perfect for multiple couples! So close to the arrowhead lift, great hot tub, and plenty of space! Great location in Arrowhead. Perfect for our group of 4 as we each had our own bedroom. The place was spotless and very well appointed. So close to the lift and everything Beaver Creek has to offer. Barbara Jean was very responsive and would love to come back next year. Great location, plenty of space and all the amenities you need! All Summer long there are free outdoor concerts, acitivities and events. Just Google Beaver Creek activities or Vail activities to find out what is happening the week that you are interested in staying with us! Weekend rates in effect during Martin Luther King Weekend, Presidents Day weekend, Holiday weekends. Also, for reservations less than 3 nights, a $150 cleaning fee is added to reservation to cover 6 hours of cleaning.